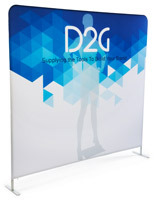 12 hanging hooks let you display a banner overtop of an existing fabric drape. 3-1/2"h pole pocket allows your graphic to easily slide overtop of display stand, if you'd prefer. Briefcase keeps equipment organized & together when traveling. 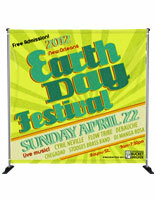 Custom hanging banner is sold without a stand to fit pipe & drape systems typically provided by convention facilities. 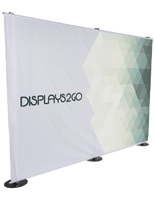 A banner backdrop allows you to present eye-catching graphics at the back of a trade show presentation, eliminating the need for large-size banner stands or pop-up displays. This large format custom display, banner backdrop is equipped with pole pockets and hanging hooks to easily attach to a piping system or stand. The back drop banner, also known as fabric banners, can be used alone as a simple back drop to any exhibit or can be used on top of your draping to further emphasize your booth's individuality and strong presence. 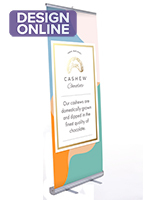 We even provide the back drop banner with custom-printed graphics, therefore making it instantly ready for use upon receipt. Simply follow the guidelines by submitting your artwork during checkout. 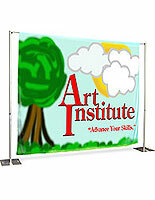 This banner backdrop is an affordable alternative to large format pop-up fixtures or mural graphics. 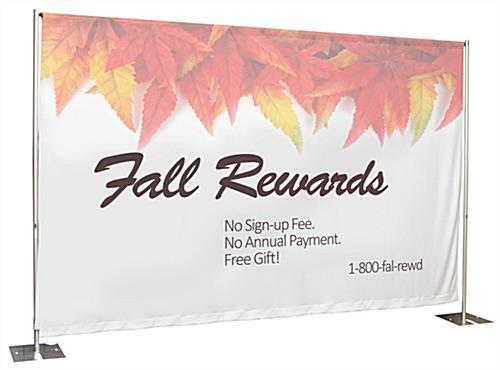 While the fabric graphics, back drop banner is still based on your own individual design, you will save money by eliminating the need to purchase framing or a pop-up system on which to showcase your graphics. 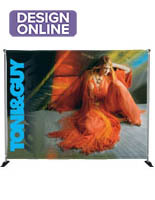 This back drop banner, such as fabric banners, is printed on heavy poplin fabric using dye sublimation techniques, therefore making it wrinkle-resistant and brightly-colored. The back drop banner is even equipped with a briefcase to store all of your equipment together during travel. 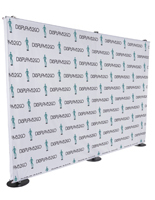 This back drop banner works perfectly within a trade show setting, yet can also be used as a backdrop during a press conference or other presentational event. 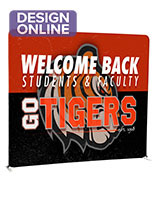 Back drop banner features a 3-1/2" pole pocket on both the top & bottom for a "live" image of 98"h.
12 grommets are evenly spaced on the back of the top pockets, so they will NOT affect your live image. Please Note: Back drop banner is sold without pipe & drape system.